Praise be to the Almighty Allah and with His blessing, the webpage of Military Training Academy has been successfully materialized. 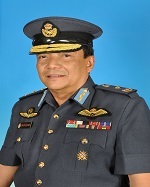 Military Training Academy is part of an organization of the National Defence University of Malaysia responsible to provide military training and administrative matters pertaining to Cadet Officers. Guided by qualified instructors, these Cadet Officers are trained and moulded to be the future military leaders for the Malaysia Armed Forces who has the characteristics of an “Intellectual Leaders of Character” possessing excellent knowledge academically and military as well as high moral and values. It is my sincere hope that this webpage would be able to serve and provide sufficient information in regards to military training and any feedbacks, views or suggestions are most welcome.